I’m a runner. For me, there’s nothing better than getting in a good run after work while listening to some good music to unwind from the workday and to un-clutter my mind from all the business of the day. But there seems to be some gluttons for punishment who just can’t seem to stop working long enough to exercise. If you like to surf the web, watch a movie, or need to work, but don’t have time to exercise, than you’re in luck. You can do all of that and EXERCISE at the same time with TheNetRunner. 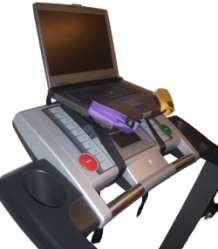 Simply strap your laptop to the console of your treadmill using TheNetRunner. It takes less than 30 seconds to set up! You can now work, surf the internet or watch movies, and walk your way to better health every day. The problem it doesn’t solve is the one of getting you to work out in the first place. I also see a problem doing anything other than walking while using this with a laptop, especially for surfing the internet. I can see the increase of 2nd degree treadmill face burn injuries if these things become popular. Now for playing a DVD, there’s another story. I think having your own desired video playing while you exercise would get more people working out – or at least not hate it so much. You can pick one up for $99.00.